Is White Pizza Okay, Ever? The great pizza debate of the decade has been all about white pizza. Is this type of pizza ever okay or is a tomato sauce-less pizza not okay? Of course, the answer to this question depends on which pizza lover you discuss it with. The problem with white pizza is simple: not all pizza makers can do it right. However, when done right, white pizza can be simply delicious! A white pizza is one made without tomato sauce and it’s typically covered with mozzarella and ricotta pizza. Sometimes, this type of pizza comes with toppings, such as clams, vegetables or Alfredo sauce. However, it doesn’t always come with topping and it can be a bit heavy sometimes. Why has White Pizza Causes such a Debate? The main reason for the debate over white pizza is the pizza it will always be compared to, which is red pizza. Many consider red or traditional pizza to be the perfect food. Some will go as far as to state they are, “in love” with red pizza. The uphill battle white pizza already has when in competition with such a perfect food is the main cause for the debate. Many pizza lovers are left with the question, “Should I get a red pizza or a white pizza tonight?” This question often leads to ordering the red pizza because it’s both familiar and delicious. What Happens When White Pizza Doesn’t Live Up? These are just a few of the issues found when white pizza isn’t made properly. Can a White Pizza be Great? Not all of these toppings are traditional. However, if you’re interested in trying something new, a white pizza topped with any of the above might be just what you’re after. 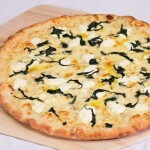 Try the White Chapel by calling Pop Up Pizza, Las Vegas’ best downtown pizza place!